-Are you a Star Wars fan? 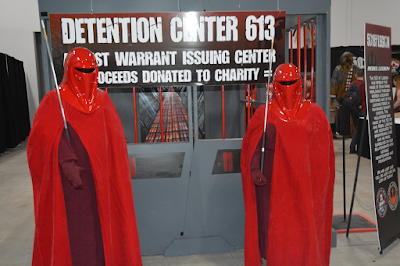 The Capital City Garrison was in attendance, so there were plenty of professional Star Wars cosplay photo ops. 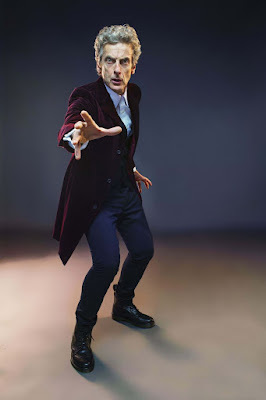 -Are you a Dr Who fan? 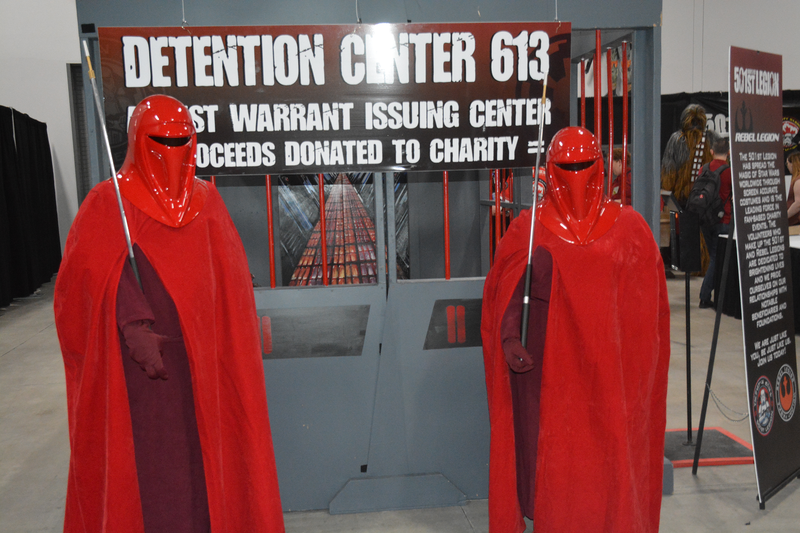 Peter Capaldi (12th doctor), Alex Kingston, and Jenna Coleman were there for photo ops. I'd probably guess that one fourth of the cosplay was Dr Who related -- for a fan of the good doctor, this probably seemed like a mini Dr Who convention. Peter Capaldi. Photo courtesy of Ottawa Comiccon media relations. -A steampunk fan? 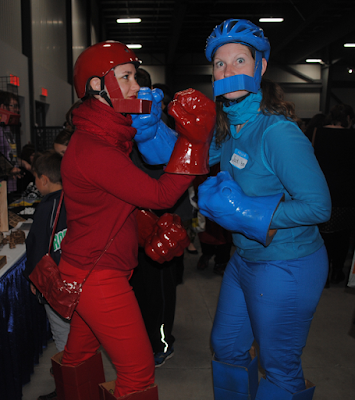 There was a pretty significant steampunk presence, but not as strong as last year's event. -An 80s pop culture fan? The original cast from 1987's Degrassi Junior High made a special appearance. Jon Cusack [Sixteen Candles, Say Anything, Grosse Pointe Blank] was also there for photo ops and a Q&A session. The car from Knight Rider, KITT, was also on-site for photo ops. Hey, it's the cast of Degrassi Junior High! Which Canadian teen didn't watch Degrassi growing up in the late 80s? 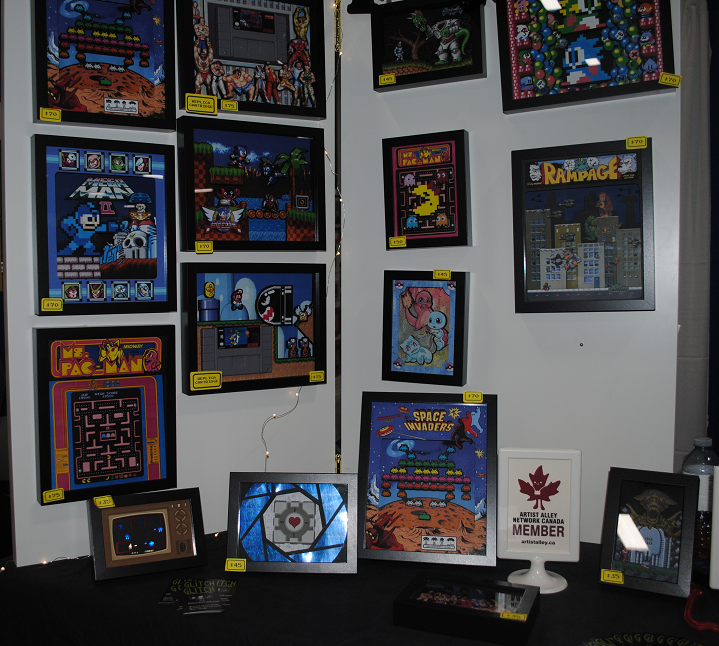 -If you're into board games (or just needed to get off your feet for a while), The Kessel Run had a gaming area set up near the back of the convention where you could sit down and try out some new games. We were lucky enough to obtain media passes for the Friday opening. Friday had a pretty modest turn-out (more so than last year, it seemed). Typically, Fridays are only open to media and convention goers with special three-day or VIP passes (it's kind of a perk to be there on a Friday afternoon before everyone else arrives). The convention centre really started to fill up around 4pm and this was a probably a result of attendees getting off from work and coming straight to the convention, and John Barrowman (The Arrow, The Flash, Legends of Tomorrow, Torchwood, Doctor Who) and Bob Morley (The 100) signing autographs that evening. Upon arriving at the EY Centre on Friday, we wasted no time in trying to secure interviews with the creators we hoped to talk to. Reality check: nearly all of them were swamped with commissions and unable to talk. One of the harsh realities about being a comics journalist for a DIY fanzine is that, when attending a comics convention, you don't always get to interview the creators you'd like to (mainly because they're too busy with signings and commissions). We were spoiled last year when Mike Grell allowed us to sit down and interview while he worked, but that was pretty much the exception and not the norm. 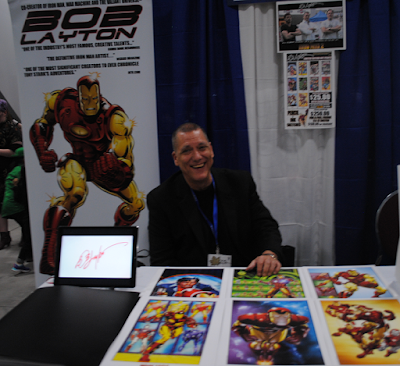 Bob Layton was pretty busy from the get-go, and was hard at work getting his commissions done before the end of day. He was pretty enthusiastic to chat with us, but we just couldn't make our schedules sync. Thankfully, he took a few moments to pose for us. Ty Templeton interviewed him in a panel on Saturday afternoon and Layton managed to answer most of the burning questions we had for him. The ever-elusive Renee Witterstaetter appeared at this year's Ottawa Comiccon. As an added bonus, she was publicist/booking agent for both Mike Zeck and Michael Golden -- two creators we had hoped to interview. "Mike doesn't really say much and doesn't do interviews", she explained. 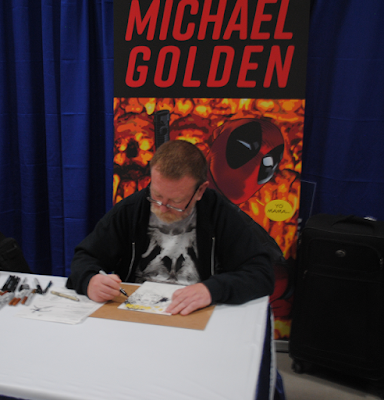 I looked over, and Mike Zeck was furiously sketching something in ink for an attendee. Michael Golden was equally busy working on something really cool for another attendee, no doubt. "I can't talk right now, but e-mail me or call me when this event is over...", Renee replied when I told her I wanted to interview her about her time at DC comics in the late 80s working as assistant editor to Mike Carlin. I plan on taking her up on that offer very shortly (maybe I'll even throw in a few questions for Zeck and Golden). 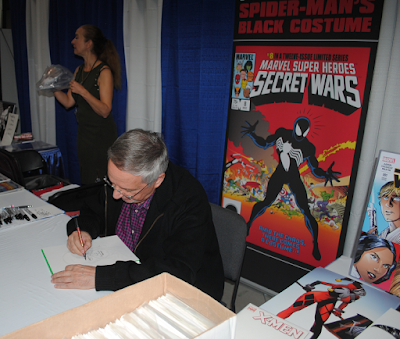 Mike Zeck working hard, with Renee in the background. 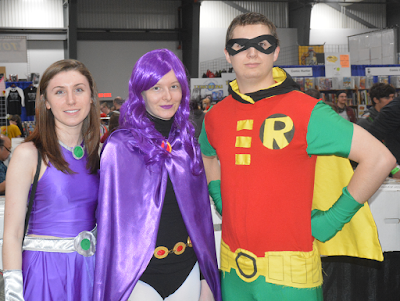 Other comic book creators in attendance were Ty Templeton (we interviewed him at last year's Montreal Comiccon), Richard Pace (we also interviewed him at last year's Montreal Comiccon), Janet Hetherington and Ronn Sutton (we recently interviewed them as well), and Dan Parent. Richard Pace was by far the most entertaining creator we spoke to with lots of interesting insights into the industry, and I really hope to get a round 2 interview out of him soon. Richard Comely appeared at this year's Ottawa Comiccon. 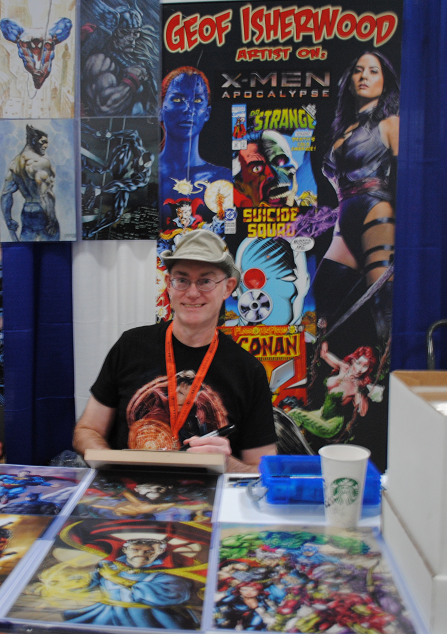 If you don't know who Richard Comely is -- he's the creator of Captain Canuck. 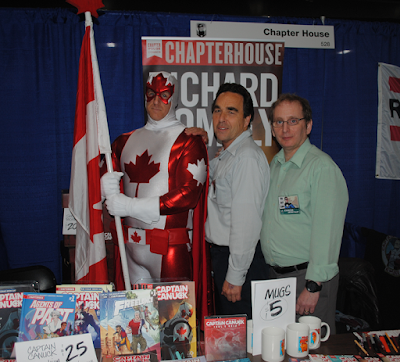 Captain Canuck (published by Comely Comix) first appeared from 1975 to 1981 in his own self-titled series, took a brief hiatus, and resurfaced again in 1993 under the Semple Comics imprint. Captain Canuck was probably on par with Captain America as far as being considered a patriotic/national symbol was concerned -- this went a long was since Canada didn't have much of a presence in DC or Marvel comics (unless you count Marvel's Alpha Flight or Wolverine originating from Canada). Comely casually mentioned to us that Captain Canuck had been licensed out to Chapterhouse Comics and will be appearing in many more comics in the future. I don't believe he's drawing or writing the title(s) anymore, but I do believe he is being regarded as a creative consultant for these projects. 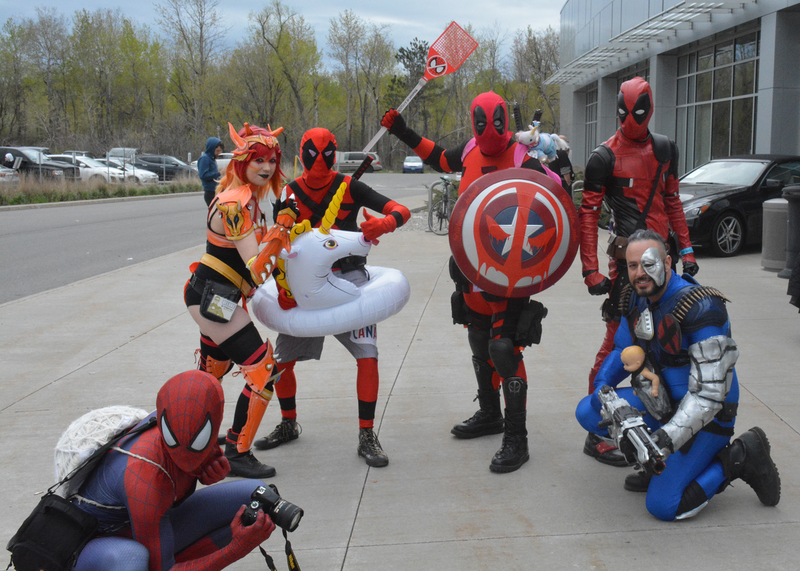 With an attendance of 42,000 visitors, it's not surprising that Ottawa Comicon needed to turn a grassy field across the street from the venue into a makeshift parking lot on Saturday. We arrived around noon and had to park in said field, and took a shuttle bus to the front doors of the convention. Immediately upon arrival, I was told that if I hurried I could make it to the John Barrowman Q&A, which apparently had everyone in stitches. I could not make it in time. All attendees told me that Barrowman puts on a great show and it's worth the price of admission to see him in a panel. 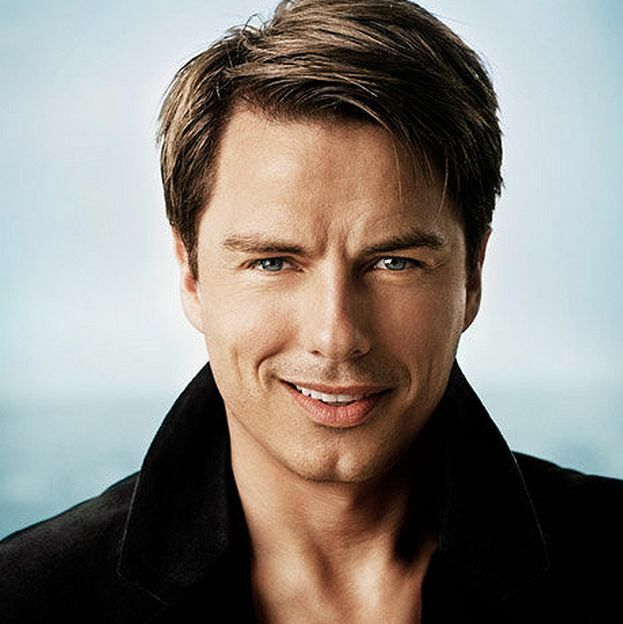 John Barrowman bio photo. Courtesy of Ottawa Comiccon media relations team. 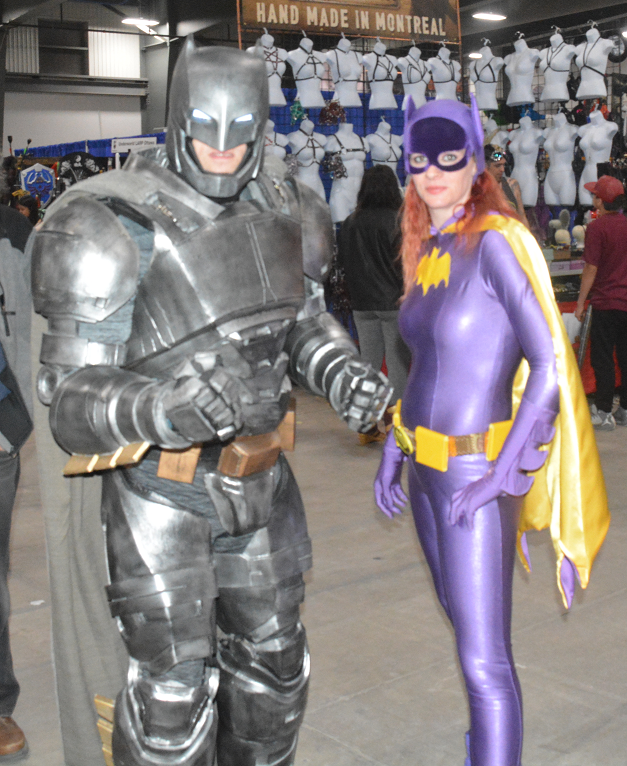 Speaking of Barrowman, if you're a fan of the DC-themed TV shows, both Robin Lord Taylor (Gotham) and Laura Vandervoort (Smallville, Supergirl) appeared on Friday, Saturday and Sunday. Madelaine Petsch, who plays Cheryl Blossom on Riverdale, was on site for a Q&A, autographs and photographs. In case you were wondering -- no, we didn't interview any of them. Here's a PRO TIP for you: the best way to get the most for your money at ANY comic convention is to try to sit in for every panel you possibly can. A lot of attendees don't realize that half the fun is sitting in on Q&A sessions with actors, actresses, creators and general persons of interest. Most attendees pay the full admission fee without realizing there's a programming schedule full of Q&A sessions, panel discussions, workshops, etc. I implore you -- check these programming guides and see what is available to you. You will be delightfully surprised. I, personally, missed a panel discussion with Chapterhouse Comics and a Q&A with John Cusack because I misread the programming guide and thought it was going to occur later in the afternoon than it actually did. Live and learn. There was a variety of creative cosplay this year, and we tried to snap as many pics as we could. Last year, in connection to the upcoming Suicide Squad film, we saw a lot of Harley Quinn cosplay. 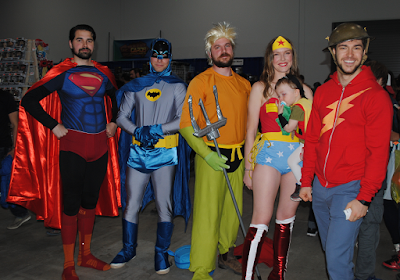 We still saw a lot of Harley Quinn cosplay this year, but we also saw a bit more diversity with an emphasis on Wonder Woman and Teen Titans cosplay. 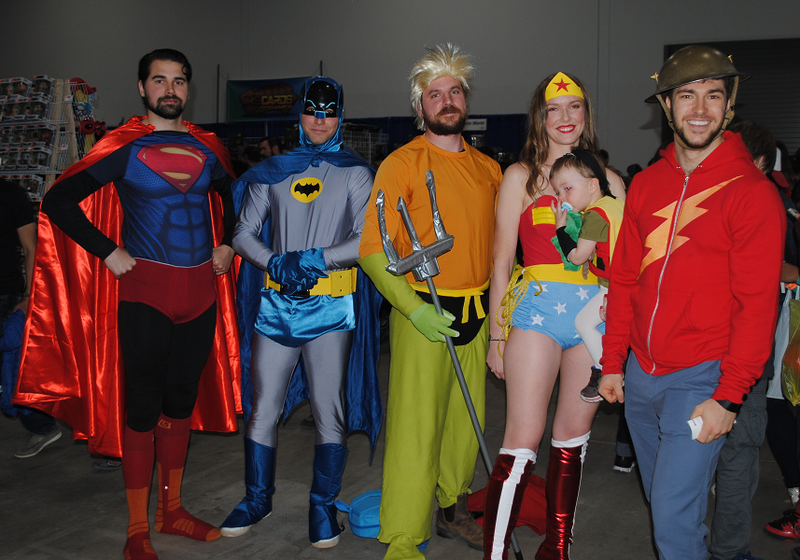 For some reason, Aquaman was a popular theme this year (probably something to do with the Jason Momoa Aquaman film coming out next year). Batman and Batman-related characters (ex: Joker, Catwoman, Poison Ivy, Riddler) are always a hit and were seen in full force this year. Spider-Man, Deadpools, Cable and Angela [?]. 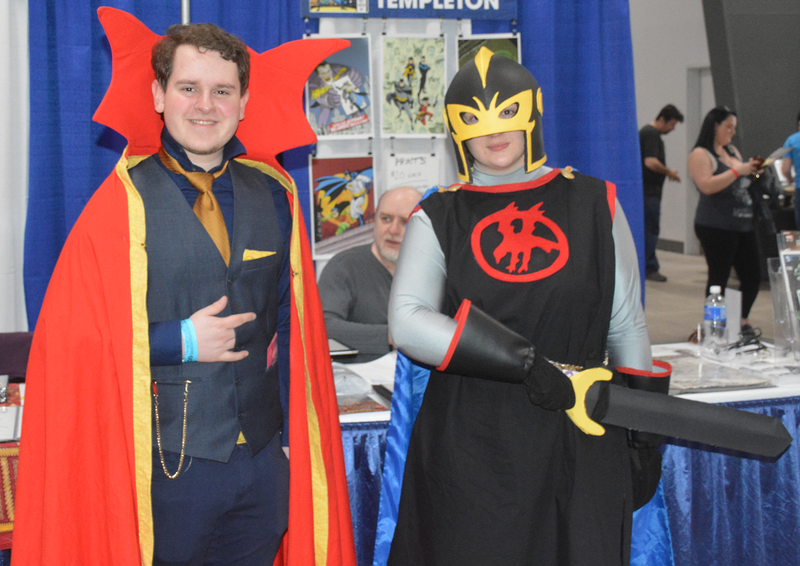 Photo source: Adrian K.
Dr Strange and Black Knight. Ty Templeton in background. 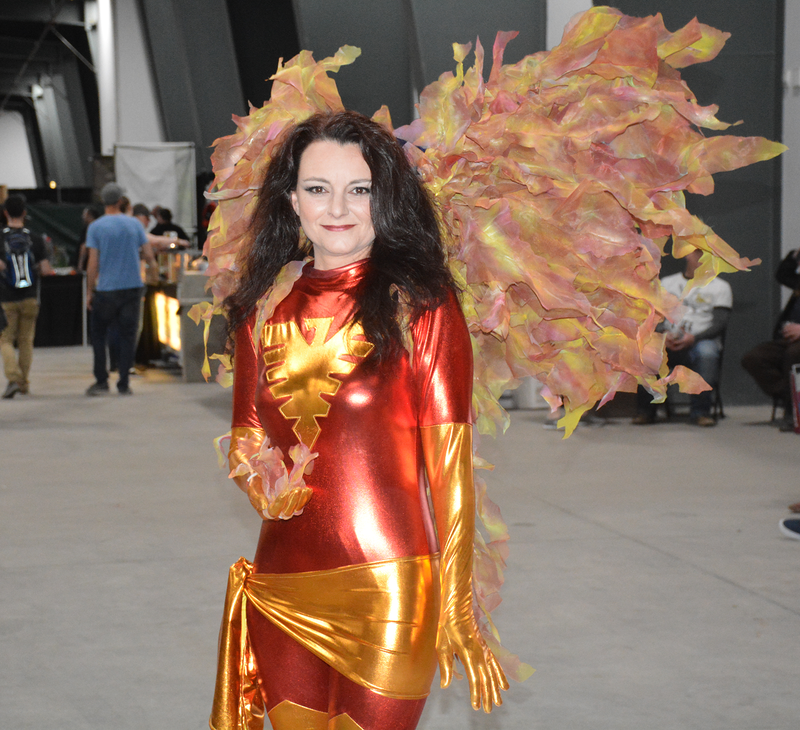 Photo source: Adrian K.
X-Factor's Polaris. 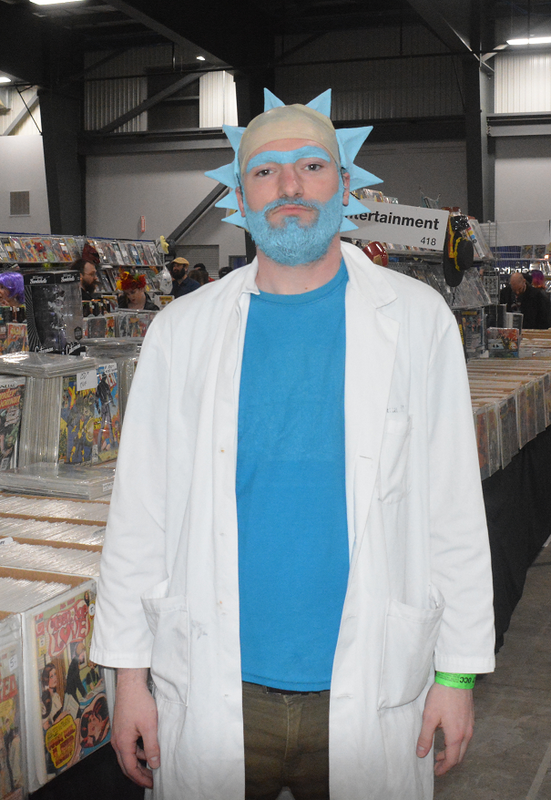 Photo source: Adrian K.
Rick of Rick and Morty. Photo source: Adrian K.
This year's Ottawa Comiccon offered lots of panels on cosplaying including such popular hits like Electronics for Cosplay 101, Level Up your Cosplay Makeup, Cosplay on a Budget, Cosplay Masquerade Basics, The Business of Cosplay (featuring Indra Rojas), How Special FX Makeup can work for you, Female to Male Crossplay Dress-up, and Dyeing and Painting Fabric for Cosplay. 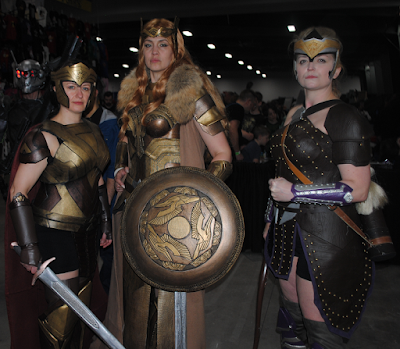 (I wasn't kidding when I said Ottawa Comiccon was extremely cosplay friendly). 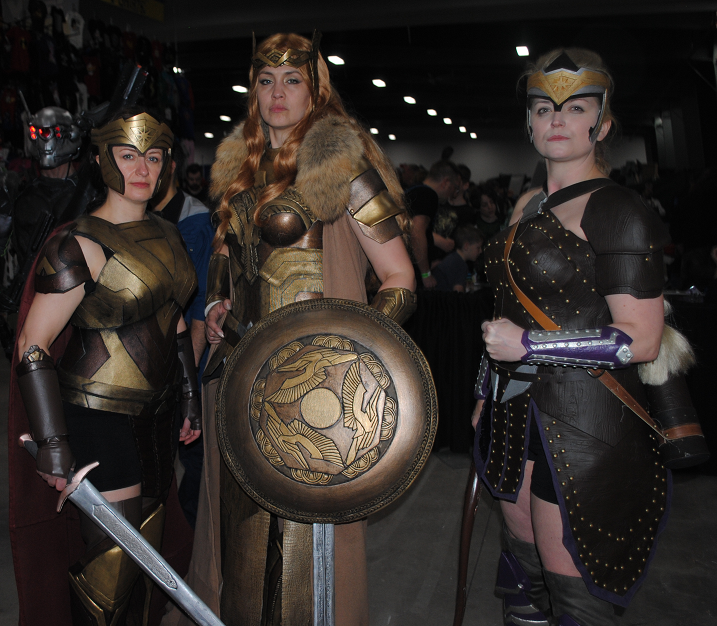 Furthermore, there was a designated Cosplay Lounge (for cosplayers to unwind and make adjustments to costumes) and lots of signage about Cosplay & Consent (which is very forward-thinking on behalf of the convention organizing committee). Above all, Ottawa Comiccon wanted to make sure it was a safe place for cosplayers. 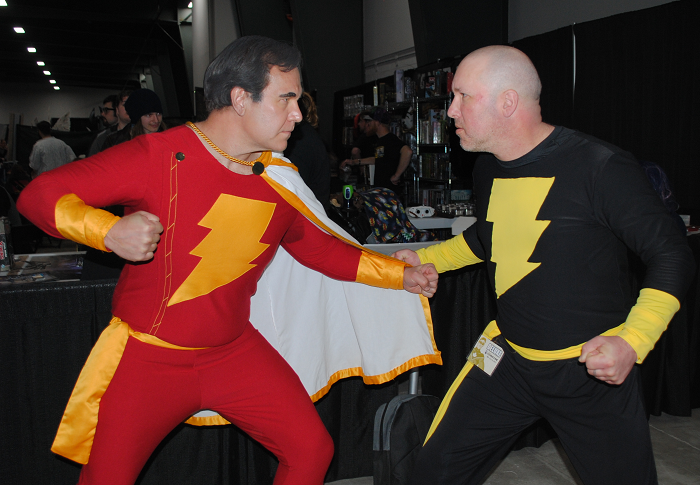 When we're not trying to get interviews or taking photos of cosplayers, we're typically walking the floor taking pics of whatever interests us and conversing with vendors and fans. 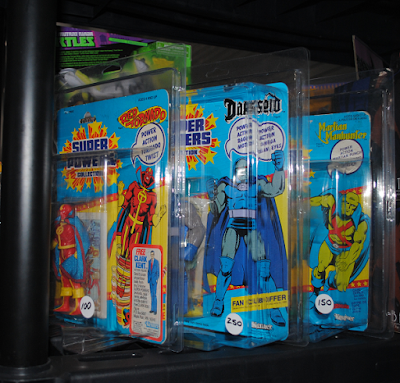 Often, I enjoy looking up the 80s toys I owned and finding out how much they go for today. I like to imagine how much my toys would have been worth had I saved them in the box and never opened them. I'm glad I didn't, because that would've led to a pretty lame childhood. 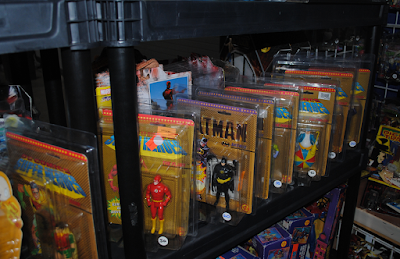 The coveted Super Powers Collection from the mid-80s still fetches a fair price. 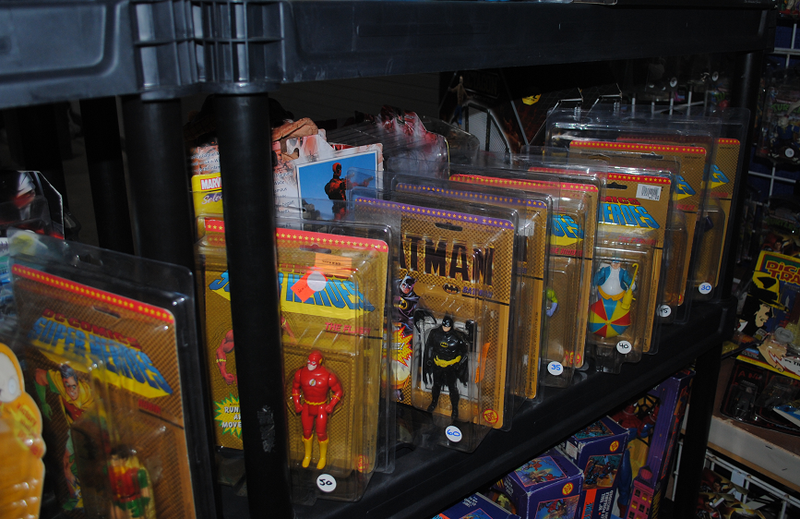 The DC Super Heroes action figures from the late 80s were slightly more affordable. Loose figs are probably the best way to go. 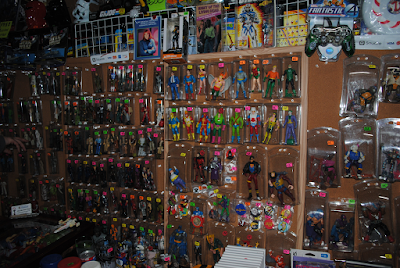 Many of them were in various conditions, and if you didn't know what you were buying, you may have ended up with a fig missing an accessory. Another item that caught my eye was this diorama on display in the Endalyon booth. It got my attention because it looked like one of those cool, elaborate 3D board games that were so popular in the mid-to-late 80s. A quick chat with the owner, Dylan Montgomerie, revealed that it's actually part of a tabletop strategy game released by Knight Models. 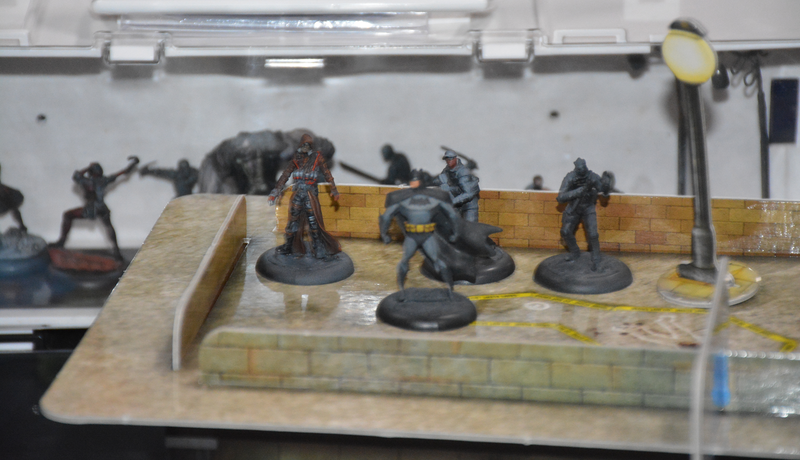 It's actually a Batman Miniatures Game that is celebrating its fifth anniversary. 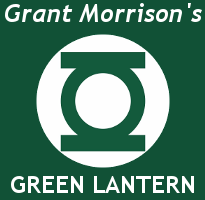 I'm a big fan of tabletop strategy games involving DC characters, so I will definitely be following up with Montgomerie for more information about this game in the near future. 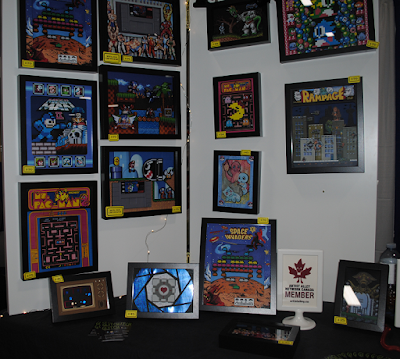 Another exhibit that I found noteworthy: Glitch Artwork had a booth in Artist Alley that sold shadowbox art displays of scenes from my favorite NES games. I spoke to the artist, and he told me that the individual pieces were cut out of foamcore with a laser printer and then assembled to created a 3D diorama. 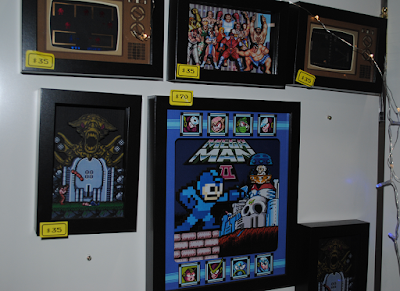 These pics really don't do them justice, so I'd recommend checking out their Facebook page for better views of their work. In a way, they kind of reminded me of Todd Reis' excellent 3D shadowbox dioramas (which are a highly coveted item among silver age comic book collectors). By now it's no secret that I have an unusual fascination with trading cards. My big acquisitions from this event were the 1994 Sandman widevision set I've been seeking for a while. From a 'what hell, this looks interesting' perspective, I picked up a Topps Robocop 2 set (complete with stickers), a 1993 trading card set commemorating Starlog magazine, a complete set (minus the checklist) of those trading cards Marvel was including in their 1993 Annuals (introducing BRAND NEW characters) and a mysterious DC Who's Who trading card set I was previously unaware of until I stumbled upon them at this convention. I've pretty much collected all of the card sets on my 'MUST HAVE' list, and am now just picking up whatever looks interesting to me. If it's a DC cereal box insert from the 1980s, or a promotional card set that was offered with a magazine (or a household product), there's a good chance that I'm all over it. All in all, I was pretty satisfied with the items I managed to find at the Ottawa Comiccon vendor tables and now have more cannon fodder for future trading card reviews. This pretty much wraps up our review of the 2017 Ottawa Comiccon. Due to Mother's Day, I was only able to attend Friday and Saturday -- but judging from the turnout from those two days I have no doubt that Sunday was just as packed. 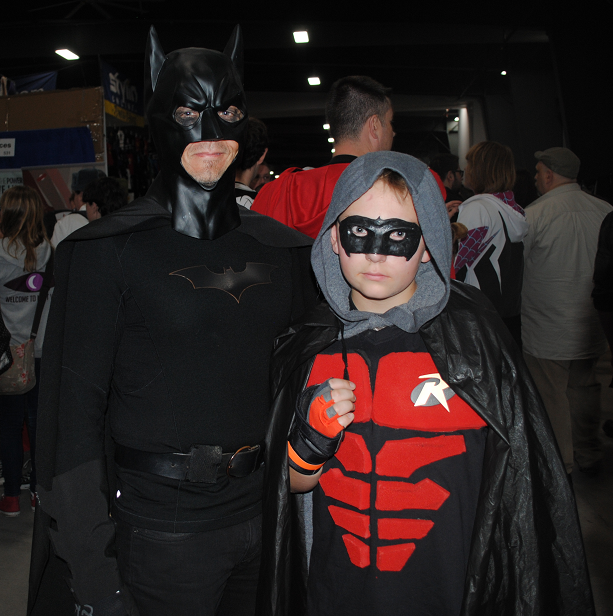 I really look forward to see what Ottawa Comiccon brings to the table next year, as I feel this year's event was extremely successful. I want to thank Leeja Murphy and all of her beautiful & talented staff from Agence Pink for all of their hard work in marketing and coordinating this event. 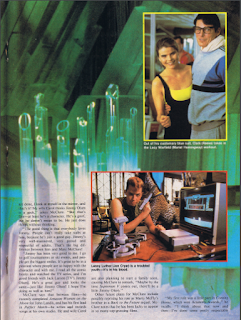 I'm going to switch gears for a minute and talk about the 1993 Starlog: The Science Fiction Universe trading card set I picked up (because I'll probably never get another chance to talk about these again). I had no clue these existed until I saw them on a vendor's table in the $5 pile. For anyone who doesn't know, Starlog magazine was one of the few reliable sources that gave you info about upcoming sci-fi movies during the pre-internet days of the 80s. Since nobody was really giving extensive coverage to comic book movies (and you could argue that they were considered 'sci-fi' as well), Starlog was covering those, too. Anyways, to make a long story short, before Wizard Magazine and *other* comic book magazines started over-saturating the newsstands in the early 90s, if you wanted insider info on a new comic book themed movie coming out, Starlog was IT. 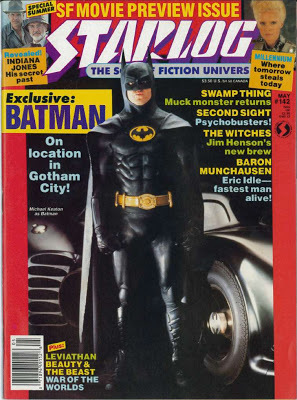 I do remember the Starlog issue with Michael Keaton as Batman on the cover. This was right around the time Batmania was starting to invade North America and we were all getting excited for the new 1989 Tim Burton Batman film. I think my neighbor owned this issue because I do remember thumbing through it quite often, but don't actually have it in my collection. While Starlog was mad legit as far as film/sci-fi journalism went, it was rather expensive at the time. Sure, those covers were really eye-catching and enticing, but for $4.50 CAD I could've purchased two or three DC or Marvel comics. Other than the cover feature, there was probably a good chance I wouldn't read the rest of the magazine. 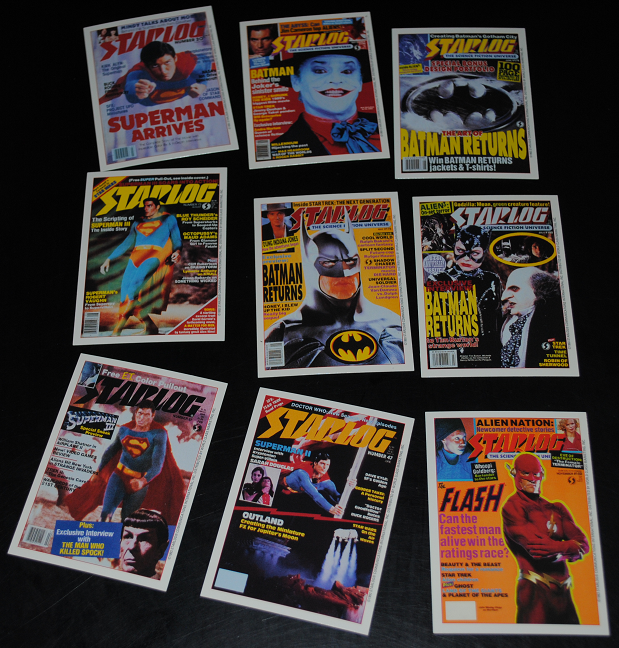 Yes, this is why I didn't collect Starlog when I was 10 years old. My best bet scenario would've been to have had an older sibling or cousin who collected them, and who would've let me borrow their issues when I wanted. Alas, no dice. 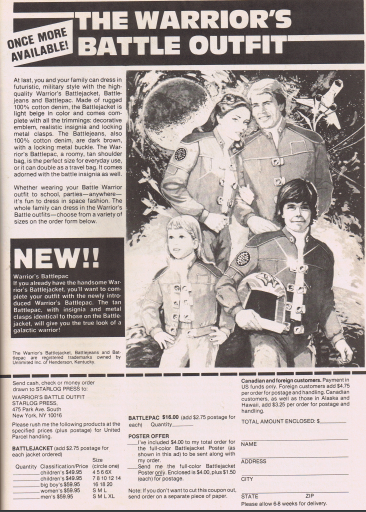 On a more nerdy note, you really had to give Starlog props for being a fanzine that actually 'made it' and had an actual subscription base, was being sold in stores, was 'mostly' full color and was actually reputable (as opposed to being xerox'd in someone's dank basement and being mailed out in non-descriptive envelopes). 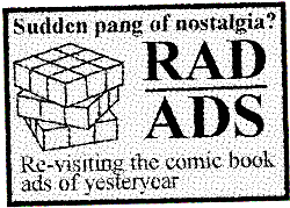 It goes to show that there was a market out there for magazines that discussed the coming and goings of sci-fi fandom, and it could actually be lucrative. 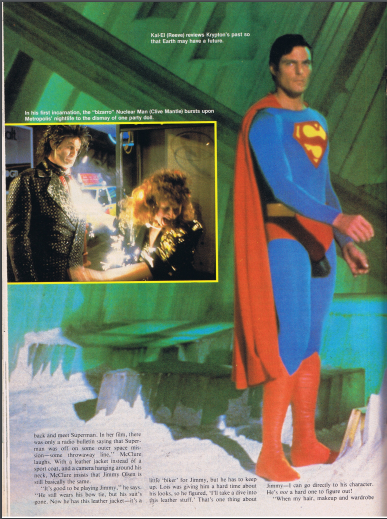 I'd probably consider Starlog to be the golden standard of what I hope DC in the 80s/Baxter Stock could become. SO, all this to say, you can probably understand why I HAD to own this trading card set as soon as I saw it. Getting down to the details: this trading card set consisted of 100 trading cards (not including the 6 checklist cards, 4 space art promo cards, 2 holograms or the 5 Star Trek mail-in cards) and had a slick glossy feel to them. 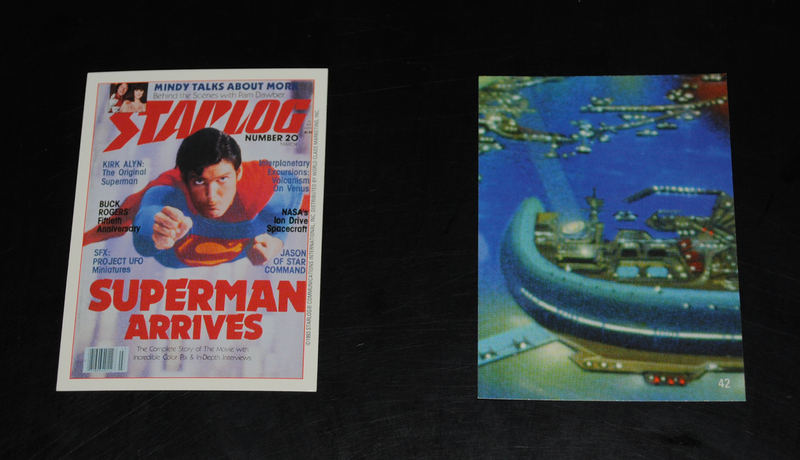 I initially thought these Starlog trading cards were inserts included in the magazine, but apparently they were sold in packs of nine. You probably guessed it -- the hologram chase cards are Star Trek themed. collection of 1993 Starlog trading cards. do you remember any of these covers/issues? The front of the card has an image of a Starlog Magazine cover. On the reverse? A puzzle piece for an art scene, of course. You can tell that World Class Marketing (the company that published these cards) were doing their best impression of a Topps trading card set (complete with HUGE 25 card puzzles) -- but with glossy fronts and backs. What did the card backs form to create? One of several puzzles featuring kool space art fantastic images (see below). 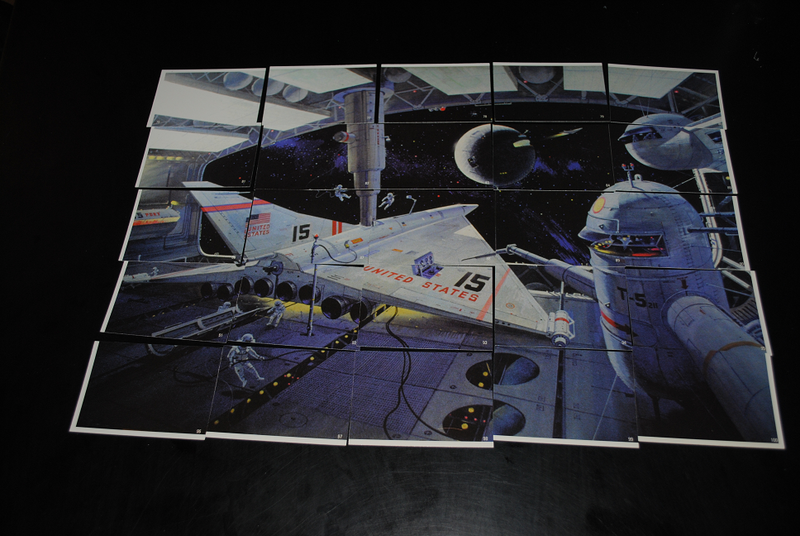 Okay, I'm lying -- I really would have preferred the card backs joined to recreate a huge Starlog magazine cover -- but I guess you can't win 'em all, right? 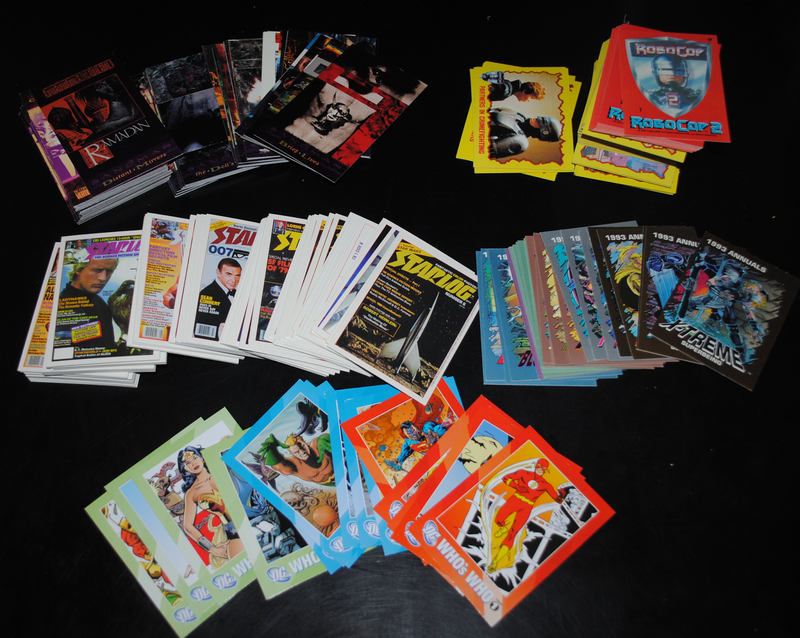 Looking back through these cards reminds me of all the big blockbuster movies of my youth (i.e. Robocop, Indiana Jones, Gremlins, Ghostbusters II, etc) and brings back a sudden pang of nostalgia for when you actually had to buy your film news off the stands. I really like how crisp and vibrant the colors on these cards turned out, and I was overall impressed with the quality. 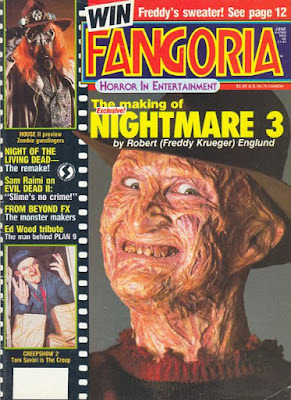 As mentioned, I will be seeking out that Fangoria trading card set. Thanks to Adrian K for accompanying me as my photographer for this event. Hey! 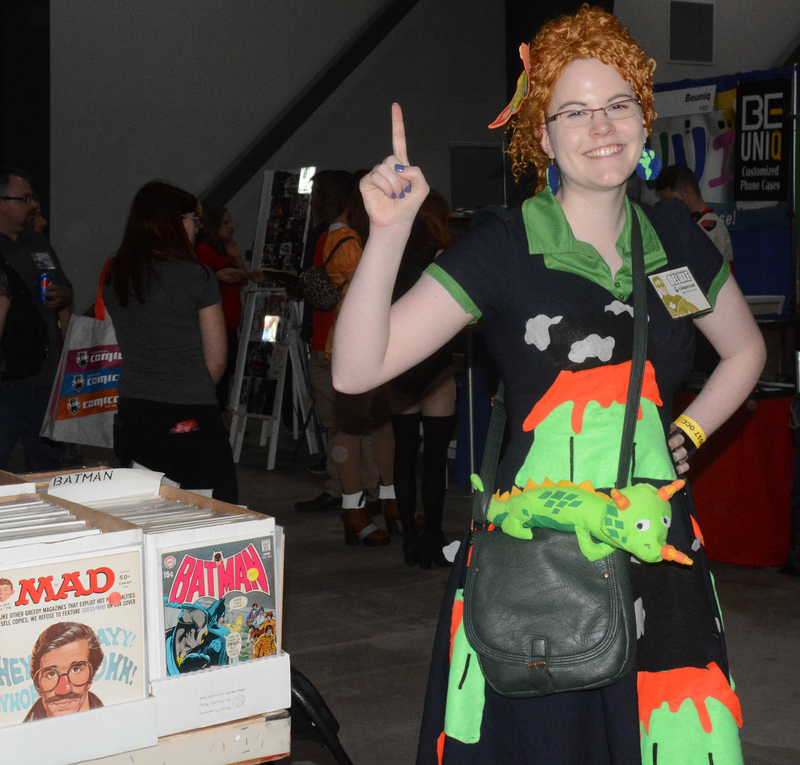 I was the Ms. Frizzle and quite a few kids wanted to say hi. I think it must still be playing on TVO or something. Totally read that as "under 35" instead of "over". My bad!